5-Hour Energy is truly a fresh pick me up for those times when you need a boost of energy to make it through your day and to keep you alert and energized. If you're a mom of younger ones like me, chasing after and of course picking up after the kids all day can leave you feeling drained. While I had heard of 5-Hour Energy, I hadn't actually made the leap to try it before this review opportunity presented itself to me. Admitting to myself that there are many times I could use an energy boost, I jumped on the chance! 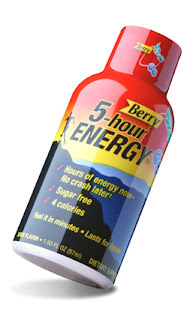 I received the Berry flavor of 5-Hour Energy to review. I didn't know quite how this concoction would taste, berry flavor or not. Surprisingly the berry flavor isn't bad at all! In fact, it's pretty tasty! Within about 10 minutes of trying a bottle I started to feel myself becoming more energized and alert. I drank the 5-Hour Energy later in the afternoon to get me through the rest of my day and it did just that! I had plenty of energy to keep after the kids for the remainder of the day. I felt fully energized for about 3 hours still after drinking it. I love that 5-Hour Energy contains no zero sugar and has only 4 calories per serving. The caffeine in 5-Hour Energy is also safe at about as much as a cup of coffee. There is zero artificial colors or dyes. 5-Hour Energy also complies with provisions set forth by the Dietary Supplement Health and Education Act. I have had a great experience with this product and I would recommend it to anyone that wants that extra boost for their day! 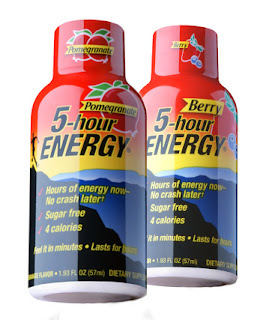 Check Out This Video To Find Out If 5-Hour Energy Is Right For You! Win A 6 Pack of 5-Hour Energy! Entry is via Rafflecopter form below. The form may take a moment to load. Good Luck! *Disclosure: I was sent a sample product for review courtesy of 5-Hour Energy, in partnership with Smiley360. All opinions expressed in this review are 100% my own and are not a result of any outside influence.